The Australian Bureau of Statistics (ABS) in November published both its House Price Index and its Average Weekly Earnings Index. Let’s therefore have a look if the country which both avoided recession and seems to have a Central Bank that is interested in controlling inflation but which to me looks like it has a bubble of a property market is still as bullish. I say has an interest in controlling inflation. The RBA has been steadily raising its cash target rate over the last year and a half to 4.75%. This is in stark contrast to the Bank of England’s 0.5% who as I’ve described before has no interest in sticking to their inflation remit with inflation now above target for about 40 of the last 50 months. Regular readers of course know that I keep a close eye on Australia as it is still a potential “retirement” location for me even if £1 today only buys a poorly $1.6199. Using the weighted average of eight cities (Sydney, Melbourne, Brisbane, Adelaide, Perth, Hobart, Darwin and Canberra) property is still booming with nominal prices up 11.5% year on year. The positive thing from my perspective is that quarter on quarter the nominal increase is now only 0.1%. Now the potentially good news for people looking to buy in Brisbane sometime in the future. Brisbane prices (my likely “retirement” location) year on year are up 3.0% year on year but they are actually down 2.1% quarter on quarter. So maybe the madness that is the Australian property market is finally starting to cool. Persons Total Earnings are up 4.1% year on year while Persons Total Full Time Adult Earnings are up 4.8%. This means the eight cities just became more expensive for the average person when looking year on year however Brisbane properties just became more affordable. Quarter on quarter earnings are up 0.1% and 0.7% respectively meaning for the quarter Brisbane affordability is also improving. As always let’s now delve a little deeper and correct for inflation. Today’s 1st chart details Real (adjusted for the CPI) Brisbane and Real (again adjusted for CPI) Australian Eight Cities House Price Indices taken from the ABS catalogue 6416.0 since 1991. This Index was reset in 2003/2004 and so I have “corrected” pre March 2002 data by taking the ratio’s of the pre and post September 2003 to June 2004 data as a multiplier. 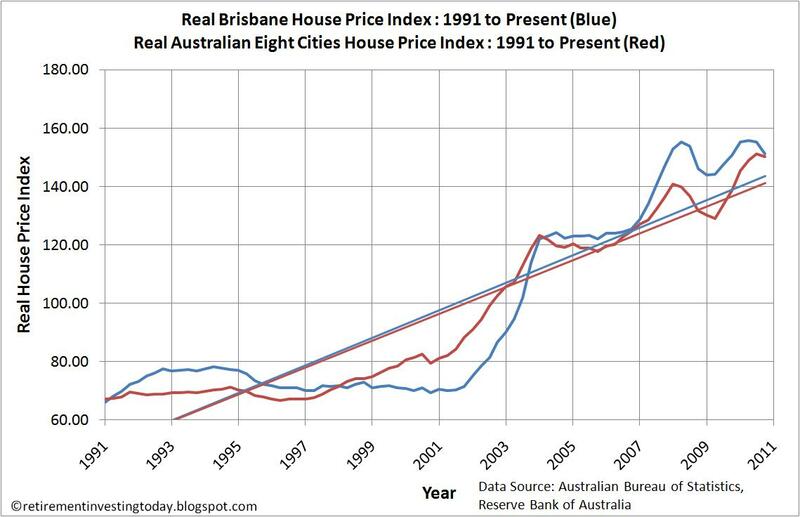 This chart carries data only until September 2010 and shows Brisbane prices turning downwards to meet the Real Eight Cities. The only question now is did Brisbane just get ahead of itself from 2006 and now we’ll see both Brisbane and the eight Cities continue their march upwards or is the heat genuinely starting to come out of the market? The 2nd chart follows the usual form and shows Real Annual Changes in price from 1995 to present. 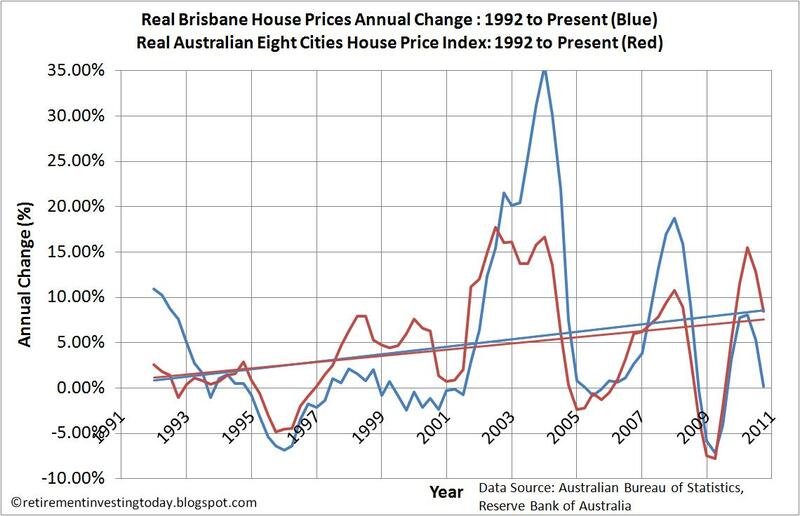 In Real terms year on year Brisbane is now treading water at 0.2% (down from 5.3% 3 months ago) and the Australian Eight Cities has seen real prices rise by 8.5% (down from 12.8% 3 months ago). 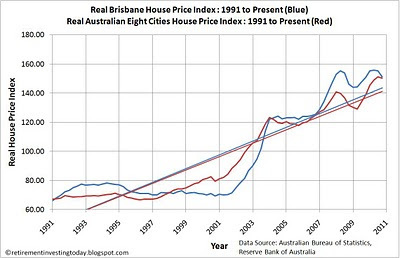 Comparing this in real terms with data since 1995 we see Brisbane with average increases of 5.2% and the Australian Eight Cities with average increases of 5.3%. 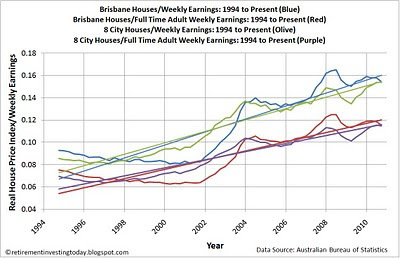 The 3rd chart shows housing affordability by dividing prices with earnings. 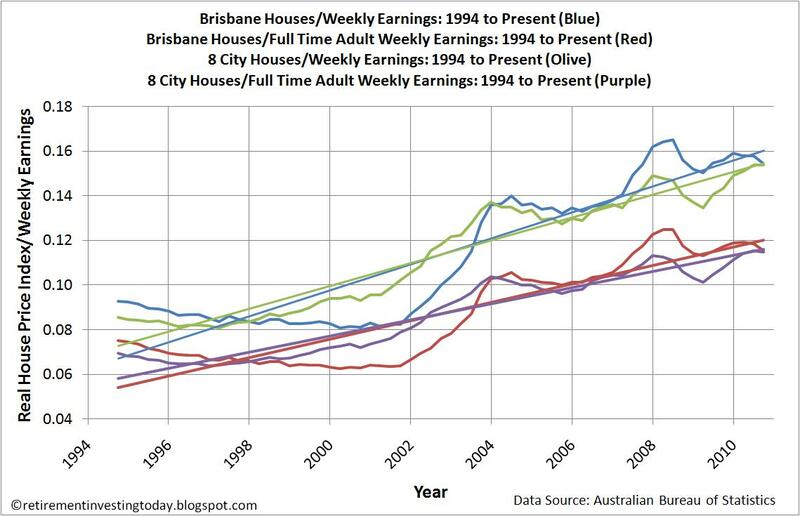 Brisbane houses when compared to Adult Full Time Weekly Earnings are sitting at 0.115 (down from 0.119 three months ago) compared to the previous low of 0.063 and the Median Eight Cities houses are also sitting at 0.115 (which is the same as three months ago) compared to the previous low of 0.064. I’m still on the sidelines and not prepared to get on a plane to look for somewhere to buy. However I am going to be watching with interest whether a downturn is in the making.